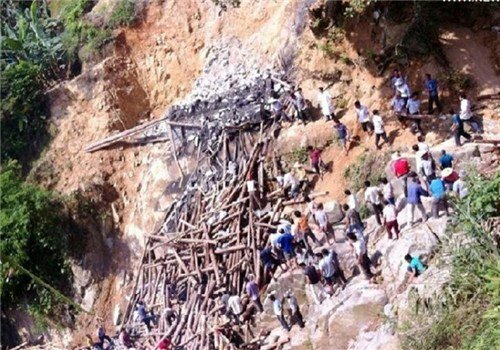 An illegal bridge has collapsed in southern China, killing 11 people, state media and officials say. The stone arch bridge was being constructed illegally at a village in Gaozhou City, Guangdong province, the officials said. It collapsed on Saturday, killing five people instantly, while six died later in hospital. Authorities are investigating the incident. The contractor has been arrested, state media report. The bridge was being built in Liangkengkou village in Gaozhou. Twenty-six people were trapped under the bridge when it collapsed, officials said. Survivors were taken to hospital after being pulled from the rubble. Government officials said the village had been ordered to stop building the bridge several times. However, the village secretly restarted construction over the May Day holiday, which ran from Thursday to Saturday, they added.